A year ago Barack Obama returned to Indonesia, where he lived as a boy, as President of the United States. In a speech at the University of Indonesia, he reminisced about catching dragonflies, flying kites and running through rice paddies in the Jakarta of his youth. "Indonesia is a part of me," he told the audience, while lauding the nation and its people for their new democracy, commitment to the rule of law and tolerance for religious diversity. Obama's affection for Indonesia is understandable. But as he prepares to go to Bali on Nov. 19 for the East Asia Summit, he needs to ditch the nostalgia and deliver a stern message to his onetime home for not living up to its purported ideals. A key measure of the level of justice and compassion in any society is how it treats its minorities  often its most vulnerable citizens. 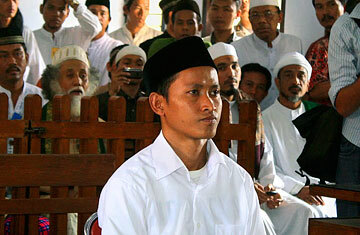 On that score, Indonesia, the world's most populous Muslim country, is failing. In the past year, public violence against religious minorities, who together make up about 12% of the 240 million population, has been relentless: there has been a slew of incidents, from burnings and bombings of churches to attacks by radical Muslims on moderates. The authorities appear unable or unwilling to firmly intervene. That seemed to be the case when I was in a packed courtroom outside Jakarta a few months ago. On trial were 12 men charged in connection with a mass assault early this year on members of the peaceful Ahmadiyah sect. Ahmadis believe that their Indian founder Mirza Ghulam Ahmad (1835-1908) was also a prophet, after Muhammad  a claim orthodox Muslims find heretical. This plus other differences have made Ahmadis a target for hard-liners in Pakistan, Bangladesh and, of late, Indonesia too. The attack on the Ahmadis was brutal. A hundreds-strong crowd gathered at opposite ends of a remote rice-farming village on the western edge of Java and converged on an Ahmadi home. The people inside were surrounded and attacked with machetes, sharpened sticks and stones. Three men died; five were badly injured. At the trial, before the judges entered the chamber, an Islamic cleric in a white robe stepped from the gallery and led the courtroom in prayer. Those inside  plus many more pressed against the outside gate  prayed for the mob, not those killed. People in the crowd told me the Ahmadis had it coming, that the mob was provoked and the violence spontaneous. One of the accused, 17-year-old Dani bin Misra, was filmed smashing an Ahmadi man's skull with a rock. He and the other defendants were convicted of "participation in a violent attack that results in casualties." Dani was sentenced to three months' jail. The rest, including two clerics, received five to six months. (By contrast, an Ahmadi got six months for wounding an attacker when defending a family's property.) Said New York City  based Human Rights Watch: "The trial sends the chilling message that attacks on minorities will be treated lightly by the legal system." We expect better from Indonesia. When the 1997 Asian financial crisis sparked mass protests that helped bring down longtime strongman Suharto, the majority-Muslim nation shattered the tired myth that Islam is antithetical to democracy. Today, Indonesia is freer and more open than ever. Indeed, many see the country as a model for the postrevolutionary Arab world. Yet institutions are weak, corruption is endemic, and military repression persists in the forgotten territory of Papua. President Susilo Bambang Yudhoyono has condemned the various religious attacks, but not, say his critics, forcefully enough. Extremists have flourished on the fringes of the moderate mainstream, spawning radical groups and religious vigilantes. Their actions undermine everything good about contemporary Indonesia. I raised the Ahmadiyah verdict with Suryadharma Ali, Indonesia's Minister of Religious Affairs, one of whose responsibilities is to keep the peace among all faiths. Suryadharma was unapologetic in tone: he said Indonesia respects religious freedom, but that minorities could not use that freedom to "completely modify" Islamic beliefs. He also defended regulations that ban Ahmadis from proselytizing or openly practicing their faith. The minister compared antagonism toward Ahmadis to flag burning: "Your country would get angry if you burned their flag. And the case of religion is higher than the flag." Perhaps so, but for Indonesia to be truly the modern, moderate society it claims to be, it needs to show through word and deed that it will not tolerate intolerance. Read "Indonesia's Rash of 'Do-It-Yourself Jihad.'" See pictures of a deadly dam burst near Jakarta.